SCE Fill Snake fills the matrix in a snake-like mode. ▪ Fill Time - Defines the time how long it takes to fill the complete LED matrix with shapes [in s]. The default value is 5. Valid values range from 0.01 to 3600. ▪ Duration - Defines the time the complete matrix is shown in solid color until the next round of objects begins to fill the matrix [in s]. The default value is 1. Valid values range from 0 to 3600. ▪ Size - Defines the size of objects [Width, Height, Depth]. The default values are 10, 10, 10. Valid values range from 0.01 to 1000. ▪ Pitch - Defines the distance between objects for all 3 axes [in % of the Matrix Size]. The default values are 10, 10, 10. Valid values range from 0 to 100. Position Origin Type - Defines the point of origin of Shapes [and hence their relative position]. Start Corner - Defines where the snake movements starts [Front Top Left, Front Top Right, Front Bottom Left, Front Bottom Right, Back Top Left, Back Top Right, Back Bottom Left, Back Bottom Right]. This setting is available for 2D, but only in 3D all options are viable. Orientation Mode - Defines the general movement direction [XYZ Orientation, XZY Orientation YXZ Orientation, YZX Orientation, ZYX Orientation, ZXY Orientation]. 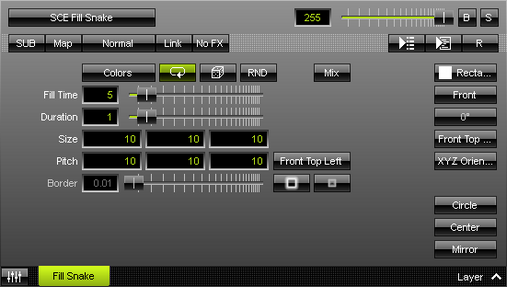 This setting is available for 2D, but only in 3D all options are viable. Circle Mode - Activates a circular snake movement. Center Mode - Starts movement from the center instead of the outer edge. Mirror Mode - Duplicates the effect by mirroring it.